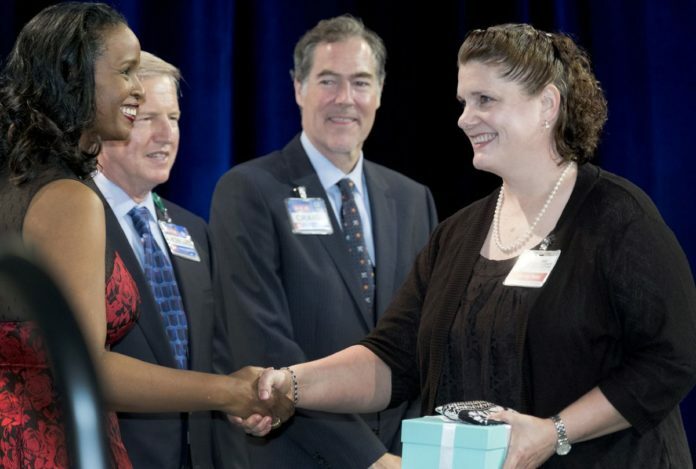 Rhonda Peña, right, a teacher at Bryan Elementary in the Mission school district, was selected Sunday for the Lifetime Achievement Award for elementary teachers as part of the H-E-B Excellence in Education Awards. AUSTIN — Rhonda Peña, a teacher at Bryan Elementary School in the Mission school district, was selected Sunday for the Lifetime Achievement Award for elementary teachers as part of the H-E-B Excellence in Education Awards. Peña’s award salutes teachers with more than 20 years of experience. Peña received $25,000 in cash. Bryan Elementary School will also receive a $25,000 grant. This marks the fourth year in a row that a Mission CISD teacher has been a finalist in the H-E-B Excellence in Education Awards and the second time a teacher has been given the Lifetime Achievement Award. In 2014, Rosbel Pena from Alton Memorial Jr. High School earned the honor for secondary schools. Other Mission CISD teachers who have been finalists in the H-E-B awards program are: Jesus Razo, Mission Jr. High School, 2015; Yvette Nevarez, Alton Memorial Jr. High School, 2016. Alton Memorial Jr. High School Principal Sylvia Garcia was a semi-finalist in the principal category in 2015. H-E-B launched the Excellence in Education Awards program in cooperation with the Texas Association of School Administrators in 2002 as a way to support public education in Texas. It has become the largest monetary program for educators in the state.